The Oregon Measure of Economic Activity rose to 0.34 from -1.06 in July (“zero” for this measure indicates the average growth rate over the 1990-present period). 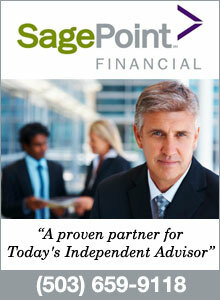 The less volatile moving-average held nearly steady at -0.46. Note that both the July and August numbers were impacted negatively by a labor dispute at the Port of Portland; without this temporary factor, both the raw and moving average observations would have been higher. After accounting for the temporary impact of the labor dispute, the measure suggests Oregon is growing near its average growth rate of the last two decades. The University of Oregon Index of Economic Indicators™ rebounded 1.1 percent in August, reversing the declines of the previous two months. Of the seven components in the UO Index, all but one improved during the month. Initial unemployment claims dropped sharply to its lowest level since October 2007. Moreover, employment services payrolls gained. 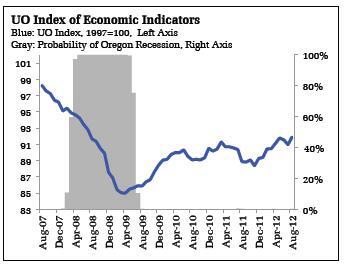 Both indicators suggest improving labor market conditions in Oregon. Residential building permits (smoothed with a five month-moving average) gained as construction activity slowly improves. Nondefense, nonaircraft capital orders rose modestly but stand 5 percent below year’s level; manufacturing activity in general is feeling pressure as the global economy cools. The UO Index suggests continued economic growth. The baseline scenario remains steady but relatively slow growth for the national economy, with Oregon following a similar trajectory. The possibility of either a sharp fiscal contraction in the early part of 2013 or deterioration in the global economy (or both) remains a risk to the outlook.